Brilliantly blazing, the star Sirius, brightest beacon in our night sky, beckons with glimpses of grandeur unimaginable. Small wonder this star was granted God / Goddess status amongst many early peoples, including the Egyptians and Sumerians. As modern astronomy unlocks our starry neighbors' secrets, evidence unfolds of the appropriateness of naming this star God. As we learn more about the nature of our galaxy and especially its magnetic field, we know that streams of energy from stars travel in specific directions, either up or down the galactic arm in which they are embedded. 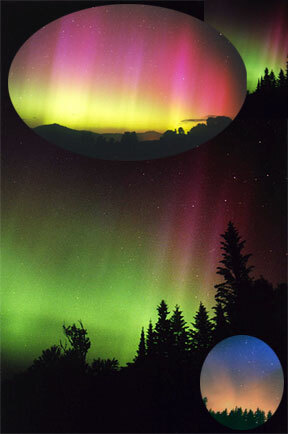 Stars are polarized to other stars, either negative and positive, some receiving energy, some sending it out, all of which travels on the path of the magnetic field lines. Recent findings reveal we are "downstream" from Sirius in the part of the galactic arm our solar system resides in. If God is the bringer of life (energy) and light, Sirius fits the description ~ it transmits its energy (highly charged particles) to our entire system via the magnetic field lines. We literally receive energy from Sirius! Did the ancient priests understand this process, thus naming this star "God"? Now our sun obviously deserves the title of "light bearer" and "life bringer," as no life could exist in the solar system without its sustaining rays. But even the majestic sun pales in comparison to the nearby Sirian star system. 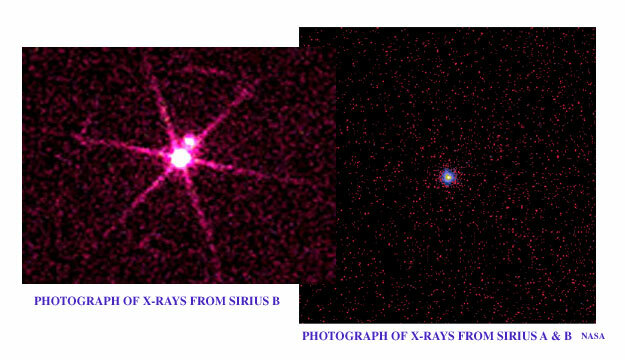 We know of two stars there, and perhaps a third, although this remains unverified (see Sirius ~ A Triple Star System). The largest, the one we see as the brightest star in all the heavens, is Sirius A, outshining our sun 10 times over with only the mass of three suns. Sirius B, a white dwarf star invisible to the naked eye, packs almost the entire mass of our sun into a globe only four times as large as the Earth. White dwarf stars are extremely dense ~ in fact, Sirius B's surface is 300 times harder than diamonds, while its interior has a density 3000 times that of diamonds. Spinning on its axis about 23 times a minute, it generates huge magnetic fields around it. The two stars dance around each other, constantly exchanging particles. Because of its greater density and magnetic field, Sirius B takes the lion's share, actually vampirizing gases and materials off of its larger host body, Sirius A. Clearly a spectacular star system giving off enormous amounts of energy, our sun appears puny and insignificant in comparison. Even during normal phases of its life, a tremendous amount of electrical energy is created on Sirius, making it the most energized, "positive" point in our little corner of space. Now this might seem like nothing more than a minor curiosity, but these are not ordinary times. Every 49.9 years, the two stars in the system, Sirius A and B, come as close together as their orbits allow, creating huge magnetic storms between them. As they approach each other, the stars both begin to spin faster as tidal forces become stronger, finally flip-flopping over, actually trading places with each other. Imagine a gigantic electrical turbine engine twisting and spinning, generating billions and billions of volts of electricity. This energy is eventually released to flow down the magnetic field lines to the sun, which transmits it like a lens to all the planets. What does this mean to life on Earth? The previous time it occurred, in 1944, humanity was locked in the greatest conflict ever seen in history, World War II. It happened most recently almost 50 years later, in June, 1993. The Tibetan master Djwhal Khul, author of the Alice Bailey books, taught in the early 20th century about the effects of the Sirian system on our world. When asked what forces were responsible for the world crisis during World War II, he listed as the number one cause "a welling up of magnetic force on Sirius, which produces effects upon our solar system and particularly upon our Earth." He proclaimed the Sirian energies stimulated both the best and the worst in humanity, as depicted in the global conflict. Does this man share the same insights as the ancient priests of Egypt and Sumeria? 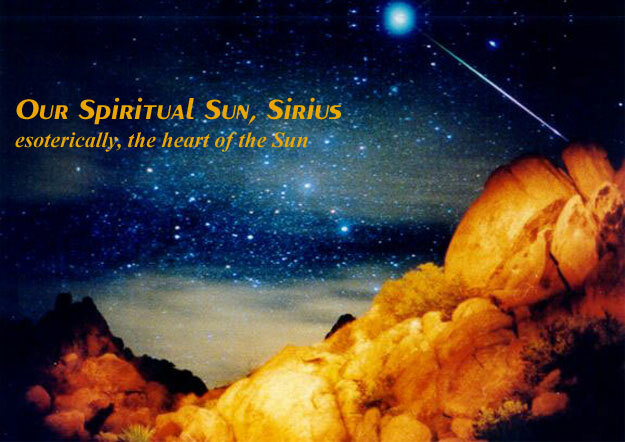 Sirius, considered by the ancient Egyptians to be the most important star in the sky, was astronomically the foundation of their entire religious system. Its celestial movements determined the Egyptian calendar ... Sirius's heliacal rising (when Sirius again rose into visibility after being hidden by the sun's light for 70 days) marked the beginning of the Egyptian year and roughly coincided with the flooding of the Nile ~ major events marked by feasting and celebration. In the Sumerian civilization, predating the Egyptians, their epic poem Epic of Gilgamesh describes a dream of Gilgamesh where the hero is drawn irresistibly to a "heavy star" that cannot be lifted despite immense effort. This star descends from heaven to him and is described as having a very "potent essence" and being the "God of heaven." Gilgamesh had, for his companions, 50 oarsmen in the great ship Argo (this constellation borders Canis Major, where Sirius is found). These elements comprise almost a complete description of Sirius B: a super-heavy gravitationally powerful star made of concentrated super-dense matter (essence) with the number 50 associated with it (describing its orbital period). What will occur when our solar system receives more electrical energy than usual? Let's pretend the Earth is a spinning top and see what happens when an electrical current or "wind" moves across it. Naturally, the top speeds up ~ modern science verifies the speed of the Earth's rotation varies with an all-time high speed of 19 hour days being recorded in rocks 3.5 million years ago. That's alarmingly fast. What happens to a sphere that spins faster? The poles begin to flatten while the middle bulges out at the equator. This action stretches the oceans causing submerged land masses to rise above sea level. Spinning also causes an extreme wobble of the Earth's axis to occur, with the globe sometimes actually falling over onto its side. Scientists know this has happened to the Earth at least nine times when it hast tilted up to 51 degrees (our axial tilt now is at 23 degrees). When this occurs, the land at the equator moves up to where the north pole is now, which explains why Alaska has fossils of alligators. Each time the Earth speeds up, it must slow down again due to the drag from the Moon, bringing about additional geophysical upheaval. Djwhal Khul further notes that certain basic changes in the orientation of the Earth's axis are now taking place ... and periods of upheaval, confusion and cataclysm always precede these great shifts in the planet's axis. He also divulges the planet is in process of taking an initiation, marked by the great event of an axis shift as the Earth literally "repolarises" itself. His prediction of "increased earthquake and volcanic activity during the last decade of the millennium" has been confirmed by world seismologists today. Seismic activity has indeed picked up dramatically in the last three to four years. California scientists state "more earthquakes are now seen in specific areas (L.A., for instance) than ever previously recorded." Many volcanic eruptions have also occurred in this same time period with Mt. St. Helens leading the fray with its 1988 eruption, Mt. Fuji's recent expulsions and of course, Mt. Penatubo's contribution. Sirius is also associated with liberation; in fact, according to ancient teachings, the very concept of freedom itself resides in human consciousness because of the influence of this star system. Interestingly enough, the time each year our sun conjuncts Sirius at 14 degrees Cancer is close to July 4, America's Independence Day. Bastille Day, the French equivalent of Independence Day is July 14, and Canada celebrates its independence from England on July 1; Dominion Day. Venezuela's Independence Day is observed July 5, while Argentina's is celebrated on July 9. And noting, Iraq's Freedom Day, when the new Coalition government took control, happened on June 28, 2004 (two days earlier than it had been announced). In 1993–1994, as the "great conjunction" of Sirius A and B approached, a wave of freedom swept our world culminating in the breakdown of the communist rule in Europe and the liberation of the Russian people from the hard-line Communist party. The Berlin Wall fell as the cold war ended ... these events transpired simultaneously with the magnetic forces building to their highest intensity on Sirius. Is there a connection? Perhaps. Because the sun is likely to speed up its rotational spin as well, its magnetic field will enlarge leading to heightened sunspot activity which in turn creates large solar flares, affecting world weather patterns and probably all phases of life on Earth. We no longer have the protection of the Van Allen belt (part of the Earth's magnetic field) like we used to. For the first time in history, we'll receive Sirian energies without its deflecting mechanism. Whatever the future holds for us, it feels safe to venture that great change is imminent for our world and civilization. Those looking for peace and security may have a difficult time finding it, externally, at least. Look within for that unfailing point of balance and stability. It has never felt like a finer time to realign with spirit, soul, higher self ... in that pinnacle of peace, comfort lies. A new picture of the universe is emerging, one of a vast cosmic interdependence and connectedness. From first cosmos to last electron, the whole universe is a complex of coils within coils, spirals within spirals, magnetic fields within magnetic fields. The stars are interconnected to each other, exchanging particles and gases constantly, all flowing down the magnetic field lines or arteries of the galactic body. Scientists now feel its very likely the galaxy's coiled field lines diverge into intergalactic space where they may ultimately be connected to other galaxies. Are these tendrils of energy the nervous system of the galaxy, relaying information from star to star, galaxy to galaxy, on and on? One can only wonder.